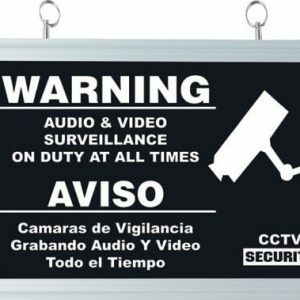 CCTV Warning signs displayed in a highly visible area are used as a deterrent to ward off thieves from your premise before an incident occurs. 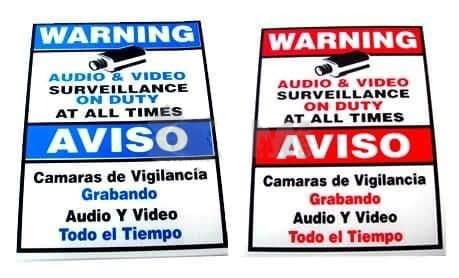 We offer English/Spanish video surveillance warning signs made of corrugated plastic with a non-sticky back make for a perfect outdoor installation. These signs range in size from 11 x 9 inches to 12â x 18 inches and can be a very valuable preventative tool when protecting your property. Whether you are a novice to security systems or a proffesional dealing with surveillance systems our experienced sales and onsite technicians can help choose the best security solution to protes your home or business chat or call 1-877-926-2288.